Yup, we know, there'a a LOT to take there. There really is a new professional racing event using only driverless cars and a GPU-maker really is putting some of its technology said autonomous supercar. Oh, and this technology will be its Drive PX 2 supercomputer. So much information. Have we fallen asleep and woken up in the world of Speed Racer? 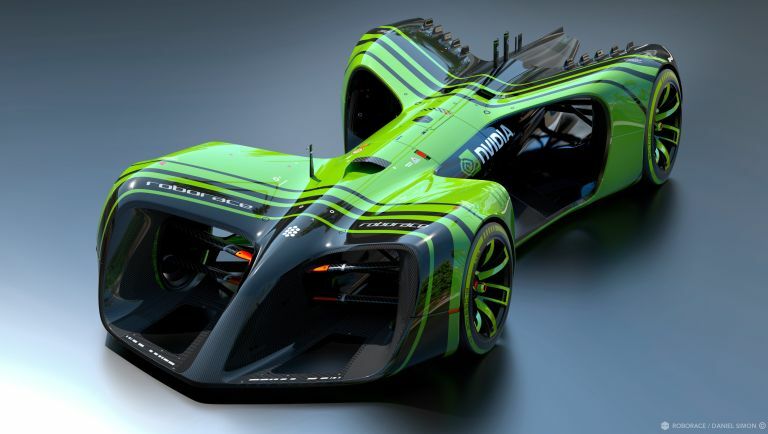 This isn't the first time Nvidia has expressed interest in self-driving vehicles either - the firm announced its intention to head into the field early last year, but none of us quite expected it to make that jump straight into the world of Formula E ePrix racing series. But that's exactly what it's doing, having revealed all the deets at the GPU Technology Conference yesterday. Nvidia's liquid-cooled supercomputer will be growling away under the hood of each of these driverless supercars, with each Roborace event consisting of ten teams with two autonomous EVs each. Each Drive PX 2 can perform 24 trillion operations per second, and all from a device no bigger than a lunchbox. Each car will be identical physically, with the only difference being the bespoke AI software running alongside NVIDIAs tech as standard. With each race lasting one hour, we're told these cars will study the track and the other races during each lap and improve each time they complete a circuit.